MacBook Air is Not “the best laptop for everyone” – but the best and best selling single model in the $1099-1850 price range – that’s entry level to fully optioned out. I infer “best selling model” from a) Apple’s small number of SKU’s and length of time between models and b) from the fact that Apple has 90% market share in the $1000 and up price category. I’d like to take up a couple of points around the MSI GT70, the Fang III X7-100. Firstly, considering you have mentioned build quality a couple of times in relation to other notebooks listed in this article, it’s worth pointing out that the build quality of the GT70 is poor. The plastics used are extremely fimble and there is noticeable flex in the underside of the chassis. Although it may have more “verve and style than Clevo’s notebooks” as Dustin mentions in his referred review, it does look a lot more tackier than the P150EM in comparison. 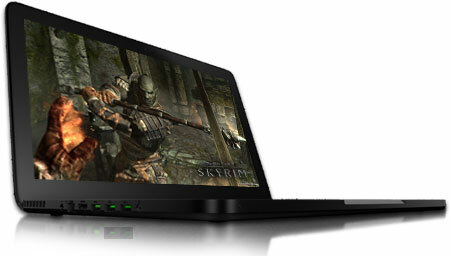 Today we’re going to be talking about the new Razer Blade (Win 8) Laptop. Razer has made quite a name for itself as one of the premiere gaming laptop providers, but how does this newest entry in their illustrious series hold up in terms of bringing honor to the name? Buying a gaming laptop can often be an intimidating process, particularly as many laptops, gaming brands in particular, are notorious for their inability to update, making it easy to suffer paralysis by analysis when trying to make sure you’re buying the exact thing you’ll need to be taking your game on the go. While the process does take a lot of thought, fortunately we have a few guidelines to follow here to make sure that you pick the exact laptop that will fit your needs, in this easy to follow list here! The Alienware M17x R4 AM17xR4-7526BK is one of the newest gaming laptops off the assembly line, but is it a strong contender to take into the gaming ring? Let’s take a look at the M17x and see what we can find out about this bad boy. The M17x is an Alienware computer, which is practically synonymous with excellence when it comes to gaming computers, and their laptop line is no exception. Today I thought I’d talk a little bit about the Samsung Series 7 Gamer NP700G7C-S02US gaming laptop computer. A newer release, it adds a slew of different creature comforts into standard gaming laptop mix, which I thought we could delve into a bit. The latest offering in the G Series gaming laptop is definitely getting some buzz. Having been released in July of last year it was touted as the most advanced gaming laptop on the market. But a few months can be the equivalent of years in computer terms, so how has the old GT70 stood the test of time? Let’s take a look! Power is what this bad boy was built for, and power it retains. The graphics card it has (the GTX 680M) is just one peg down from the latest flagship GeForce GTX series laptop cards, meaning that it has lost little in terms of graphical power in the months since it was launched.